Special thanks to Lee Ackerman for this story and GM Media Archives for the photos! 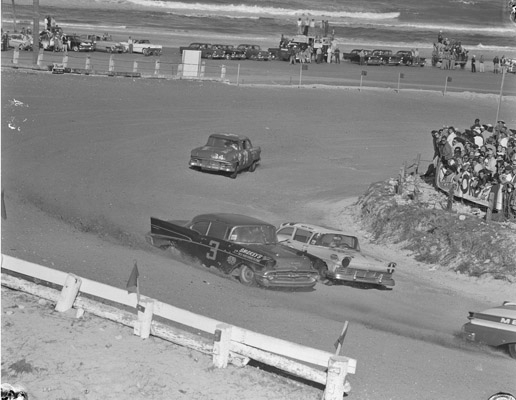 By the mid-50’s, the automotive manufacturers had determined that winning in the NASCAR Grand National (Sprint Cup) series would help them sell cars. It was the start of the win on Sunday sell cars on Monday theory. While automobile manufacturers had supplied resources to various factory supported teams they had not actually owned those teams. That was about to change. At least for a short period of time. In 1956 General Motors formed a racing division for Chevrolet and Vice President and General Manager of Chevrolet hired Vince Piggins away from Hudson to lead the effort? Frankie DelRoy was also brought in to help. 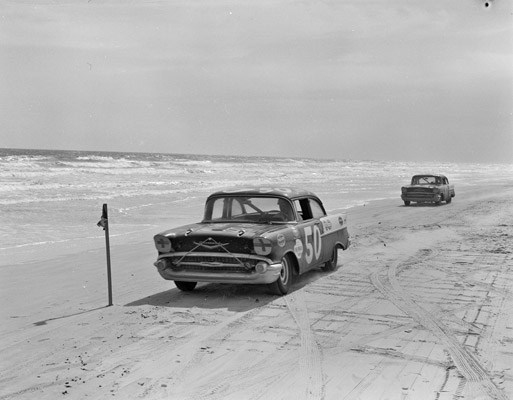 The task of Piggins, DelRoy and their team of engineers was to prepare a fleet of cars for the 1957 NASCAR season, debuting at the Daytona Beach Race. A company called the Southern Engineering and Development Company was established in the Atlanta, Georgia area. In the later part of 1956, six identical 1957 Chevrolet were brought to the Georgia location and preparations began for their Daytona debut. SEDCO would choose a black and white color scheme. Because of this the cars became known as “Black Widows.” These cars were not production cars, but limited edition cars that came from the factory ready to race. A seventh car was delivered to the garage of Dale Swanson in Harlan, Iowa for the purpose of preparing it for the successful defense of the International Motor Contest Association Stock Car Championship. 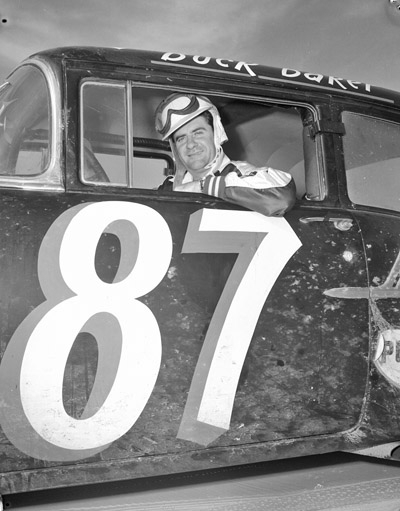 Swanson and driver Johnny Beauchamp had stood the IMCA stock car series on its head in 1956 by winning 43 features and running away with the series Championship. Swanson was one of the most knowledge mechanics in racing when it came to the Chevrolet. By Christmas of 1956, things were behind schedule in Georgia and Chevy executive Vince Piggins placed a call to Dale Swanson. He had Swanson come to Atlanta to help out. Swanson a savvy dirt track mechanic knew what it took to make a car run fast on the dirt and still be there at the end. 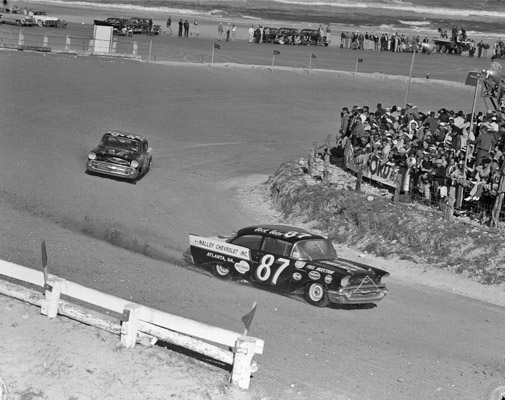 Remember Daytona was still a beach and road course and the majority of tracks that NASCAR ran on in 1957 were still dirt. Swanson set about taking one of the six cars in Georgia and retooling it to his specifications. Once completed, Piggins and the engineers inspected the car. Piggins liked what he saw and recommended the other five cars to be built just like the car prepared by Swanson. Swanson would stay in Atlanta sharing his knowledge with the Chevrolet engineers until after the Daytona race and then he would return to Iowa to get ready for the IMCA season. One last minute modification was caused by problems with the fuel injection system. Swanson, not wanting to take a chance decided to go with two-four barrel carburetors. Chevrolet was finally ready to take on NASCAR with a factory team. 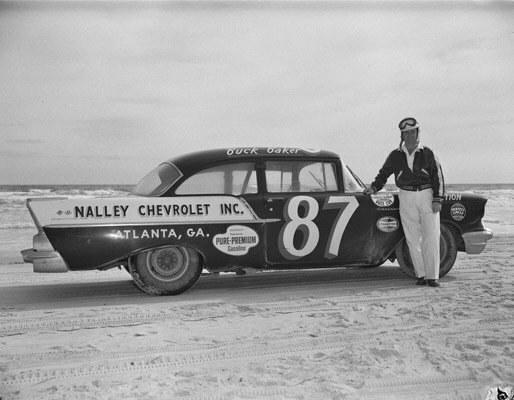 A southern mechanic named Hugh Babb, also working at SEDCO was listed as the owner of all the factory Chevrolet entries. 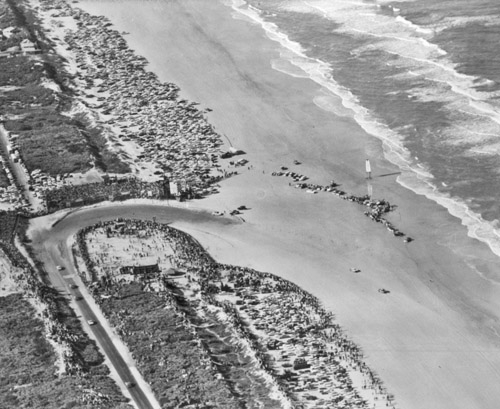 The Chevrolet Factory team made its debut in annual Beach and Road Course race held in Daytona Beach. Six Factory Chevrolets were entered in the event. The drivers were Buck Baker, Jack Smith, Speedy Thompson, Rex White, Frankie Schneider and not but certainly not least, Dale Swanson’s driver Johnny Beauchamp. 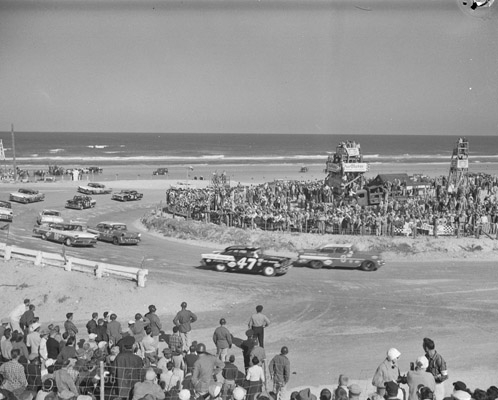 On February 17, 1957 they ran the fourth race of the season at Daytona Beach. Cotton Owens driving a Ray Nichols prepared Pontiac won the event but the Hugh Babb Chevrolet contingency performed well in their first outing. 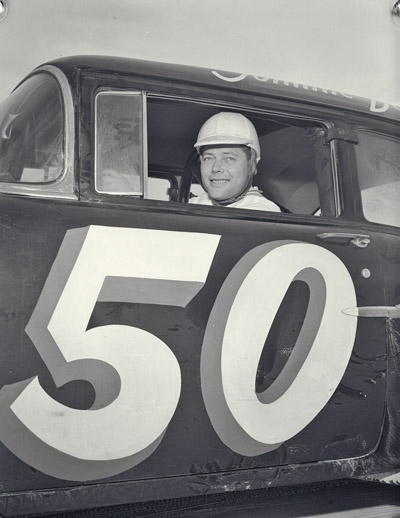 Johnny Beauchamp, Swanson’s regular driver, drove the #50 Chevrolet to a second place finish. 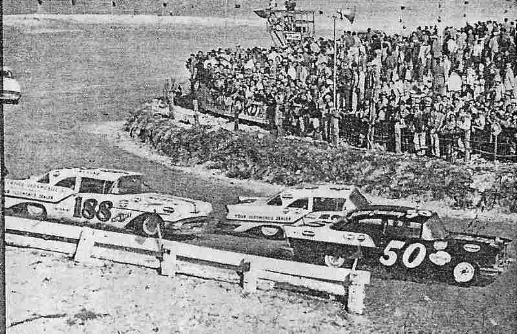 Buck Baker brought a second car home fourth, with Speedy Thompson and Rex White bringing two more of the Chevrolet factory cars home 8th and 9th. It had proved to be a very successful debut for the Chevrolet Factory Team. Two weeks later at the Concord Speedway in North Carolina, the Chevrolet Factory Team scored a clean sweep with Jack Smith passing Speedy Thompson with 14 laps to go and going on to win the race, Buck Baker also got by Thompson for second place and Thompson held on for third. On March 17 at Wilson, North Carolina, Baker and Thompson ran second and third to a factory Ford driven by Ralph Moody. Yes the same Ralph Moody that would become famous as part of Holman-Moody. The following week at Hillsboro, NC they scored another clean sweep. This time in front of General Motors President Ed Cole, who was on hand for the event to evaluate the Chevrolet effort? 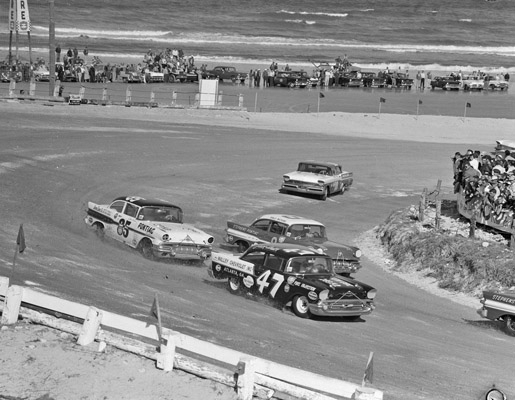 Buck Baker took the lead with 12 laps to go and went on to pick up the win. Speedy Thompson was second and Jack Smith third. The next few races would be dominated by the DePaolo Engineering Ford Factory Team with Chevrolet’s having a reasonably good showing. But the factory team concept came to an end following the May 19 running of the Virginia 500 at Martinsville. A car driven by Billy Myers crashed through the guard rail and injured several spectators, some seriously. The race was stopped after 441 laps. 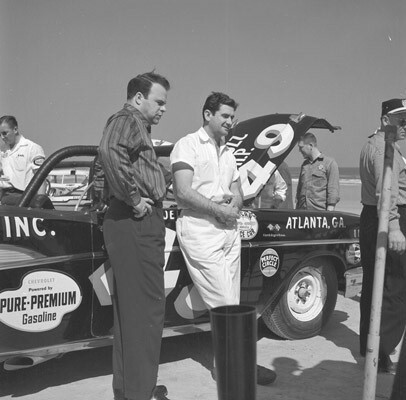 Buck Baker was awarded the win. It would be the last win for the Hugh Babb Chevrolet Factory Team. The Automobile Manufacturers Association (AMA) already concerned with excess horsepower decided to draw the line. At their June 7 meeting, the Board of Directors voted unanimously that the industry should have no association with the racing industry. Hugh Babb’s named disappeared from the ownership list and the drivers suddenly become independents. While the direct factory support was gone, Chevrolet would have an outstanding season in 1957. Buck Baker would win 10 races and give Chevrolet their first NASCAR Grand National (Sprint Cup) Championship. Speedy Thompson would finish 3rd in points and Jack Smith 5th. Chevrolet’s would win 21 races in 1957 following their debut at Daytona. The 1957 Chevy faired very well in the NASCAR Convertible series as well. 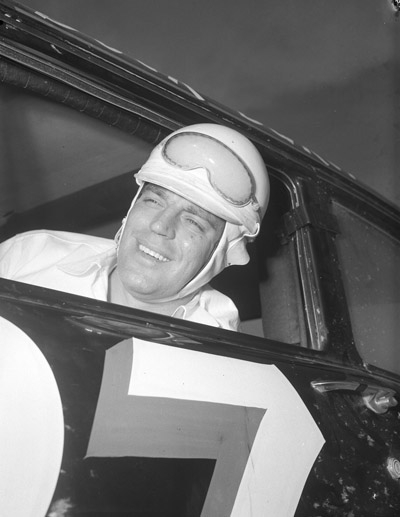 Bob Welborn driving a Hugh Babb Chevy and later after the manufacturers pulled out a car in his own name would win the 1957 Convertible series championship. After returning to Harlan, Iowa, Dale Swanson would go back to preparing the seventh Chevrolet for the defense of the IMCA Stock Car Series. Johnny Beauchamp would also return to Iowa and once again team up with Swanson. The Swanson-Beauchamp team would start off the IMCA by winning at the Louisiana State Fairgrounds in Shreveport and go on to once again dominated IMCA Stock Car racing winning 32 races on their way to their second straight championship. The direct factory support of NASCAR teams would disappear from NASCAR for several years, but Chevrolet with the assistance of a quiet mechanic from a small town in Iowa, had made a big impact in NASCAR racing. Also to noted auto racing historian John Havick for his input and comments. In 1952 The Society of Autosport, Fellowship and Education (SAFE) was founded by Chuck Scharf. It started racing in the Chicago area but over the next couple of years expanded its operation. In 1955 the series toured the country as an all convertible series called the Circuit of Champions “All Stars.” In December of 1955 SAFE merged with NASCAR and in 1956 NASCAR started its own convertible series which ran through the 1959 season. When we look back on the NASCAR convertible series, one name comes to mind, Bob Welborn. Welborn was the King of Convertibles. Bob Welborn of Denton, North Carolina may have been too logical for his own good. He won the 1st NASCAR championship race ever held at the Daytona International Speedway. It was the 1st 100 mile preliminary championship. In winning Welborn averaged 143.198 mph. At Daytona he never won much else. Welborn started his NASCAR career racing modifieds at Bowman-Gray Stadium in Winston-Salem. Bobs’s first NASCAR Grand National event was on October 19, 1952 at Martinsville, Virginia driving the J. O. Goode Plymouth he would finish 20th dropping out with steering problems. 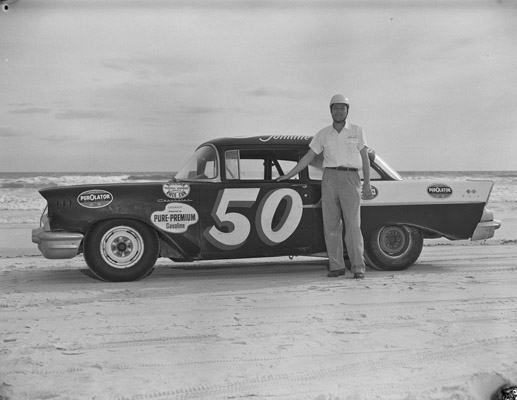 In 1953 he ran 11 Grand National events and recorded two top fives. In 1954 driving for several car owners he recorded only 1 top 5 and 3 top tens. 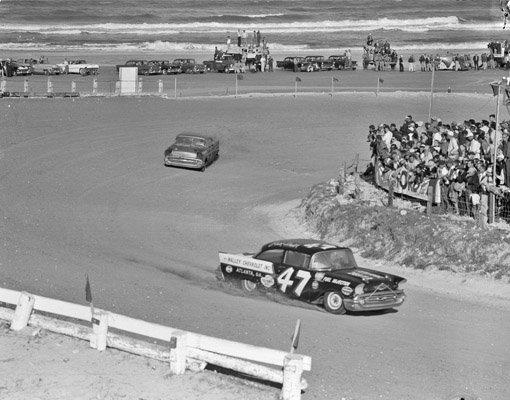 In 1955 driving for Julian Petty, Lee Petty’s brother, he started 32 of the 45 Grand National events and scored 9 top fives. He did pick up his first Grand National pole that year at Greenville, South Carolina. It was in 1956 that Welborn found his niche in the newly formed NASCAR convertible series. Bob reasoned that the convertibles were going to take over the sport because the fans could see the driver. Bob got himself a Chevy factory ride when the company came into racing. 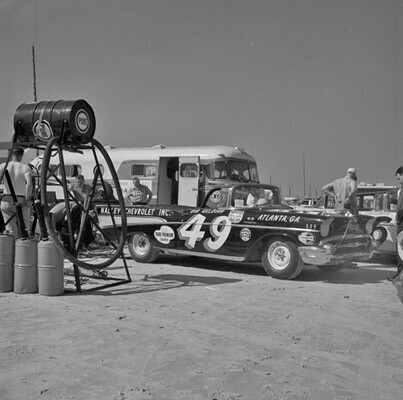 Welborn would compete in 45 of the 47 events winning for the first time at the Champion Speedway in Fayetteville, North Carolina on April 8, 1956 driving a 56’ Chevy. He would finish the season with 3 wins and the series championship. In 1956 Bob competed in only six Grand National events. In 1957 behind the wheel of a 57’ Chevy Welborn would once again rule the convertible series grabbing 9 poles while running all 36 events. He would win six times including 5 in a row and grab his second straight convertible series championship. Bob would compete in only 4 Grand National events in 1957 but driving his own car won his first Grand National event the Old Dominion 500 at Martinsville on October 6. In 1958 still behind the wheel of a 57’ Chevy he dominated the 19 race schedule in the convertible series grabbing 6 poles and winning 8 events and his third straight series championship. He also had a great year in the Grand National ranks racing in just 18 events he scored 5 wins behind the wheel of Julian Petty’s 57 Chevrolet winning at Fayetteville, Martinsville, Greensboro, Winston-Salem and Myrtle Beach. It is difficult to think of BobWelborn without remembering the ever-present cigar in his month. That cigar was the key to the man. If it was small and frayed from chewing, Welborn had problems. If the cigar was new and full and he puffed on it, Welborn was doing well. But he was most dangerous when he held it in his fingers because even if he was talking he was also thinking and he had found an edge on you or other rivals. In 1982 Bob was inducted into the National Motorsports Press Association’s Hall of Fame. He was also named one of NASCAR’s 50 Greatest Drivers. Bob passed away on August 10, 1997. One thing is for sure when you think of the NASCAR convertible series, the first name that comes to mind is Bob Welborn.